Nicholas Grimald was a 16th century English poet, playwright and man of the church whose allegiances swung from Protestant to Catholic to suit his circumstances. His name is sometimes written as Grimoald, or Grimaldi, and many of his pieces of work were in the form of songs or sonnets. Nicholas Grimald was born sometime during the year 1519, or possibly in 1520, in Leighton Bromswold which is in the county of Huntingdonshire. His parentage is open to much speculation with many believing that he was the son of the Italian Giovanni Baptista Grimaldi. He grew up amongst hard working yeoman farmers and it was said that the young Nicholas was inspired to write romantic poetry having observed how his mother and father doted on each other. One such was A funeral song, upon the death of Annes his moother which was written in 1555 to commemorate the loss of his dear mother. He had probably written this while studying at Cambridge where he exhibited clear skills as a budding poet. He graduated with a BA in 1540 from Christ’s College but decided to continue his education at Brasenose College in Oxford. A year later he wrote his first play which was the resurrection of an ancient Latin production called Christus Redivivus. Another BA degree was award at Brasenose and Grimald then moved to Merton where he successfully obtained a MA degree. It seems that he never had time for marriage, and yet he wrote in romantic terms about two women who took his fancy. 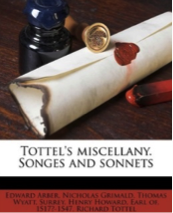 They appear in some of his verses that are included in Tottel’s Songes and Sonnets. He questions the validity of marriage, amongst other things. He was outspoken on religious matters too and his association with Nicholas Ridley, the Bishop of London found him accused of heresy which, at that time, could have led to his being burned at the stake. He escaped this dreadful fate only because he recanted of his ways but this, inevitably, led to his being ostracised by Protestant contemporaries. In 1553 Ridley rewarded his friend with an appointment as chaplain to the bishop and it seems that he held Grimald in high regard from the start. It was not a happy relationship though when, as Queen Mary began her brutal prosecution of Protestants, Ridley was imprisoned. Grimald also ended up incarcerated in Marshalsea prison, in 1555, although it was a fairly brief sentence. It seems that he switched his allegiance once again, back to Catholicism, thus causing an irreparable rift between the two former friends. Ridley was eventually executed. Nicholas Grimald’s death is shrouded in mystery but it is believed that he died sometime between the years 1559 and 1562 which would have meant that he only survived to his early forties.